Even though the Aeroscraft dwarfs the largest commercial airliners, it requires less net space on the ground than any plane because it doesn't need a runway The airship takes off and lands like a helicopter -- straight up and down. This is not a blimp. 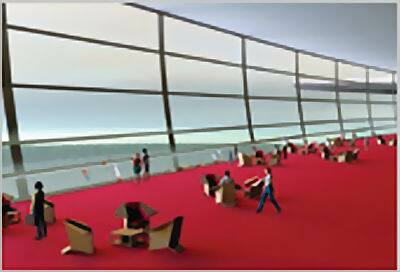 It's a sort of flying Queen Mary 2 that could change the way you think about air travel. It's the Aeroscraft and, when it's completed, it will ferry pampered passengers across continents and oceans as they stroll leisurely about the one-acre cabin, or relax in their staterooms. Unlike its dirigible ancestors, the Aeroscraft is not lighter than air. Its 14-million cubic feet of helium hoist only two-thirds of the craft's weight. 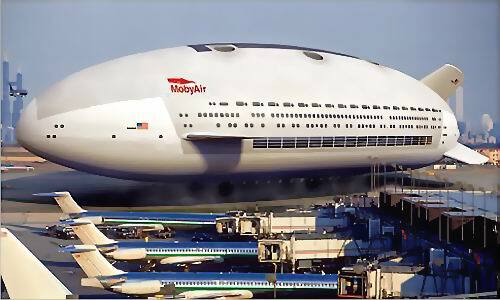 The rigid and surprisingly aerodynamic body, driven by huge rear- ward propellers, generates enough additional lift to keep the behemoth and its 400-ton payload aloft while cruising During takeoff and landing, six turbo-fan jet engines push the ship up or ease its descent. This two-football-fields-long airship is the brainchild of Igor Pasternak, whose privately funded California firm, Worldwide Aeros Corporation, is in the early stages of developing a prototype and expects to have one completed by 2010. Pasternak says several cruise ship companies have expressed interest in the project, and for good reason -- the craft would have a range of several thousand miles, and, with an estimated top speed of 174 mph, could traverse the continental United States in about 18 hours. During the flight, passengers would view national landmarks just 8,000 feet below, or, if they weren't captivated by the view, the cavernous interior would easily accommodate such amenities as luxury staterooms, restaurants -- even a casino. To minimize noise, the aft-mounted propellers will be electric, powered by a renewable source such as hydrogen fuel cells. A sophisticated buoyancy -- management system will serve the same purpose as trim on an airplane, allowing for precise adjustments in flight dynamics to compensate for outside conditions and passenger movement. The automated system will draw outside air into compartments throughout the ship and compress it to manage onboard weight. The company envisions a cargo-carrying version that could deliver a store's worth of merchandise from a centralized distribution center straight to a Walmart parking lot, or, because the helium-filled craft will float, a year's worth of supplies to an offshore oil rig. Aeroscraft: Purpose - Long-range travel for passengers who are more concerned with the journey than the destination.